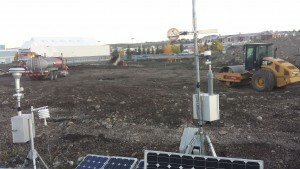 KLS is working with an Environmental Consulting firm at a site in southern Alberta that requires the construction of a long-term impacted soil management cell on the site prior to further site grading and new building construction. Impacted material from the site will be consolidated into this specialty cell and capped with 1m of clean clay fill. The cell area will be a future parking area for a commercial development and requires compaction to 98% performed in specified lifts. As this site is impacted, and in an operating commercial area, unique and strict safety and operating procedures were developed to protect both the workers and nearby businesses/citizens. The Environmental Consultant is continually monitoring air quality during construction/remediation activities. The project requires surgical excavation, segregation, and stringent fill placement requirements. This project demonstrates the versatility and specialty skills of the KLS team to meet the clients requirements and achieve remediation goals.